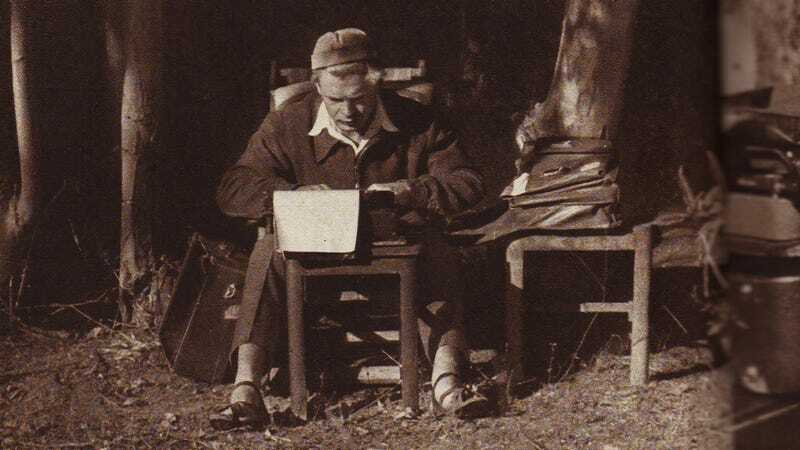 Jiří Hanzelka types up a report in his makeshift office in Cochabamba, Bolivia. The Tatra traverses the temporarily flooded Río Grande in Jujuy Province, Argentina. A gentleman inspects the otherwordly Czech car in La Paz, Bolivia. The Tatra roars across the Altiplano, with 21,122-ft Illimani in the background. A broken ignition is met by several helping hands in Bolivia. Locals surround the Tatra in Potosí, Bolivia. The Tatra in a sea of cardón cacti (Trichocereus atacamensis) somewhere on the Altiplano. The Tatra with villagers in Iscayacha, Bolivia. Between Tres Cruces and La Quiaca in Jujuy Province, Argentina. A rest stop at 14,600 feet above sea level. To avoid suspension damage in the high desert, Hanzelka and Zikmund crossed streams like this by walking ahead of the Tatra and feeling for rocks with their bare feet—in the 43 °F water. After 4,000 miles in the Andes, Jiří Hanzelka enjoys a well-deserved break on a Peruvian beach. Repairing front suspension damage on the way to Ticlio in Peru, at an elevation of 15,500 feet (click Expand to see photo). The terrifying Yungas road in Bolivia (click Expand to see photo). Many terrible jobs were described by the authors on their trip across the Andes, but nothing beats guano mining on the Chincha Islands. The book comes with a fold-out elevation map. Heights are in meters. This is the last part of the Peru leg.